Here at The Ordinary, we’ve developed a new secret serum to make your cares and worries melt away. After a great deal of research that involved many bottles of wine, a few dark-and-stormy-mojitoes (that’s rum, ginger beer, mint and lime), and the occasional cup of mint tea and honey, we have learned that we were searching in the wrong direction altogether! We are, at this time, prepared to unveil our secret discovery. It turns out, the answer is toad pee. Not taken orally, of course, but applied to the hands. Here’s how it all came about. Let us say, hypothetically, that a mother might have an incredibly cranky day. She might find herself in a foul mood, unable to get anything done that she needs to, and faced at every turn with sassy, rude and constantly needy children. (Not you or I, of course, we’re speaking of an imaginary person here.) Let’s say this mother’s throat hurts from so much yelling, and she feels terrible about it, because obviously, it doesn’t work to yell, or she wouldn’t be doing so damned much of it. Let’s say this bad mood continues even when the boys spontaneously and beautifully break into a rendition of Shake Your Tail Feather at the exact same time as she sees a goldfinch in a puddle shaking his tail feathers. Let’s say this bad mood continues while she makes dinner, and gets worse after when she’s folding stupid laundry. And then the whole family decides to go for a walk. They start down a nature trail. It’s very dusky among the trees, even though it’s barely eight o’clock. Everything is green and bright and glowing in the evening light. Somebody says it’s a good time of day for screech owls. So the whole family tries to call them by imitating their wavering downward cry. They scare off every living thing for miles. It gets so dark they decide to leave the trail, and they walk up into the park. The oldest son says let’s walk over and look at the river. The dad says, “It’s a Magritte sky!” And it was! Pale as day above the trees, but the branches and trunks are black and shadowy, and across the river the lights of cars and buildings shine as if at night. The world is shifting, as they watch, from light to dark. They pass a giant elm tree – it would take all of their arms to circle it. And suddenly there are toads everywhere! Everybody catches at least one for each hand. The cranky mom is smitten! A toad pees on her hand, and she doesn’t care. The feeling of the tiny toad hands brushing against hers, and the soft toad nose butting against her palms as it tries to push its way out makes her so happy that she doesn’t mind anything any more. They walk over to the bridge, which is surrounded by bright sky but stretches into blackness, suspended between day and night. And then they hear the screech owls crying deep in the dark pool of trees. Well, I have no idea who that cranky mom was, but one thing that always makes me feel better when I’m irritable is cooking with the boys. The other night I had this whole meal planned out. Planned out to the last little pine nut, I tell you! And as I stood slicing my eggplant, Malcolm ran in determined to make a sauce with shallots, peppers and tomatoes. Okay, I said, that sounds good. Then Isaac jumped around saying, “What do I get to make?” What do you want to make? I asked. He peered in the vegetable drawer. 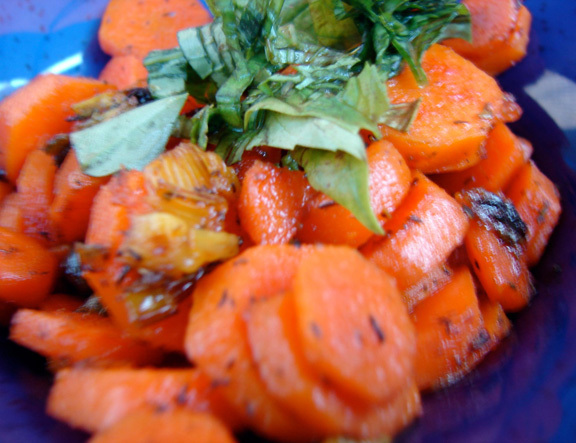 “Carrots,” he replied, “And flavor dynamites.” He smelled a few spices. And these…(he had thyme, sage, smoked paprika and turmeric lined up.) Well, okay, I said, let’s get cooking. 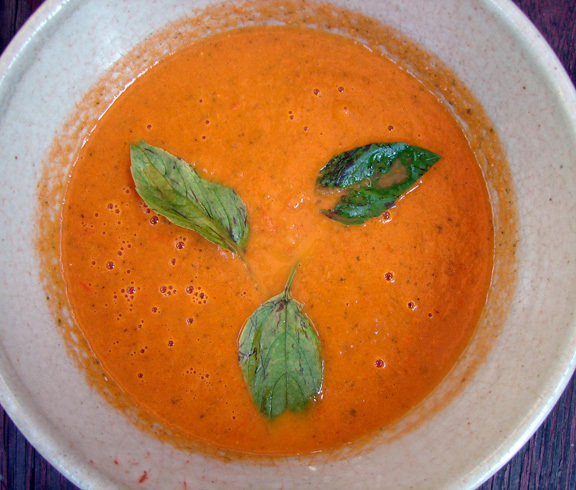 Malcolm’s sauce has cumin, smoked paprika, cilantro and fresh basil, so it’s a bit like Moroccan chermoula. As for the eggplant – I keep making it the same way, and I decided to try something a little different. I sliced it thicker, and cooked the slices slowly so they became quite soft. Then I stacked them with french lentils, made my favorite way, and with chard sauteed with golden raisins, garlic, and pine nuts, which is one of my favorite things to eat on the planet, and a slice of mozzarella. Delicious with Malcolm’s sauce and Isaac’s carrots and a salad. And some rosemary focaccia, which I made in 1 1/2 hours! All time record! I should note that the boys arranged their food and took the pictures themselves. Here’s The Five DuTones with Shake Your Tail Feather. Warm the olive oil in a pot over medium heat. Add the shallots and cook till they start to brown. Add the garlic, and cook a minute or two. Add the pepper, stir to coat and cook till it softens a little, add the tomatoes, spices, and a bit of water. Bring to a low boil, and then reduce the heat and simmer about 10 minutes, breaking the tomatoes up with a wooden spoon. When the peppers seem quite soft, add the butter and balsamic, and puree the sauce until smooth and a bit paler. Season with salt and pepper, and stir in chopped cilantro and basil. Warm the olive oil in a small frying pan over medium heat. Add the carrots, capers, thyme and sage, and cook until the carrots start to soften, and the bottom of the pan gets brown and caramel-y. Add about 1/3 cup water, and stir well, scraping the bottom of the pan. Add the paprika and turmeric, and cook for about 5 minutes, till the carrots are bright and juicy. Transfer to a small bowl, season with salt and pepper, and top with fresh basil. Prepare the french lentils like this. Drain the broth and save it to make a soup or risotto. Warm the olive oil in a large frying pan over medium heat. Add the chard, with water still clinging to its leaves, and sautee until it’s wilted. Add the garlic, pine nuts, and raisins. Cook till the pan is dry, and the pine nuts and garlic start to brown. At this point you can add a bit of water, scrape the caramelized bits from the bottom of the pan, and continue to cook for about five minutes, till the chard is wilted but still bright and flavorful. Cut the very top and bottom off the eggplants, and peel thin strips about an inch wide, about an inch apart all around them. Slice them into 1/3 inch rounds. Arrange these in a thin layer and lightly salt them. After about half an hour blot the salt off. Pour over some of your 1/3 cup olive oil and the rosemary. With your hands, stir the olive oil in gently, trying to get everything covered. Pour over a little more oil if you need to. Let sit about 1/2 an hour to absorb the oil and the rosemary flavor. Generously oil two big baking sheets. Beat an egg in a small bowl and pour it over the eggplant slices. Toss them lightly to be sure they’re all covered on each side with egg. Put the flour and lots of pepper on a plate. Put each eggy piece of eggplant in the flour, turn once…you want it to be lightly coated, not dredged. Set each egged, floured round of eggplant on the oiled sheet. Then turn it over, so the other side gets oiled. When the eggplants are all lined up in a single layer, pop in the oven and bake for about 40 minutes, till they’re soft and browned. Turn them from time to time so that both sides get brown. For the last five minutes, stick them under a hot broiler. 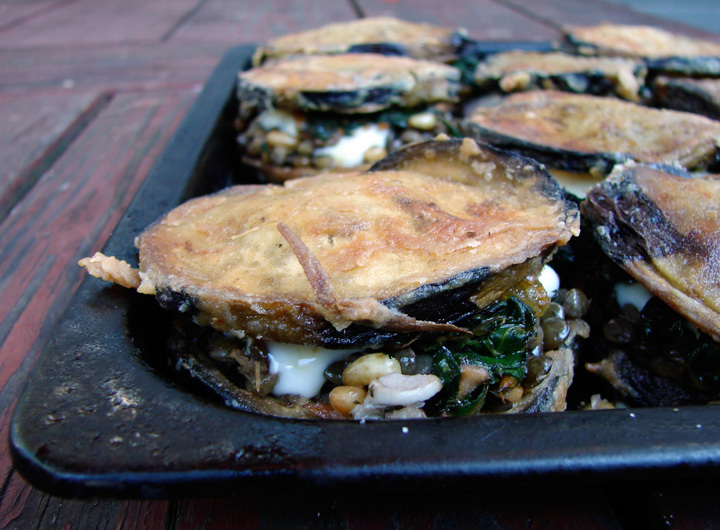 On a clean baking sheet, place a layer of roasted eggplant rounds. Put a heaping tablespoon of french lentils on each one. Put a slice of mozzarella on the french lentils, mound some chard on top of that, and put another round of eggplant on top. Put in a 375 degree oven for about ten minutes, till the cheese is melty, and everything is hot through.